The Shed works because of peculiar effects of surface tension. Water adheres to a the granular surface of the shingle rather than to a perforated plastic-coated metal plate coated because the shingle has much more surface area in each square inch than the plate. 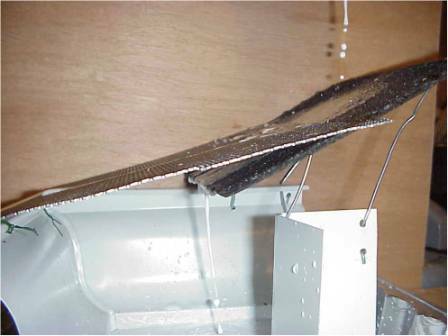 Water passes under and through the line of contact of the Shed with the shingle, but leaves, seeds and other debris pass onto the surface of the plate. Rain falling directly on the Shed carries the debris over the outer edge. Any debris remaining on the Shed will dry and be blown off by wind. 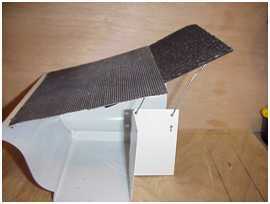 A model of the Gutter Shed, including a section of standard gutter, a shingle in position above the gutter, and a Shed perforated plate connected to the outer lip of the gutter and lying on the shingle. A thin white solution is applied simulating rain on the shingles of a roof. Note that essentially all of the rainwater flowing down the roof shingle passes under the edge of the Shed to enter the gutter.